Child migration is a global phenomenon. Today, an ever-increasing number of children and young people are on the move to escape poverty, conflict, abuse and environmental hardship. Sadly, for the estimated 40 million international migrants under the age of 20, the life they find can often be more traumatic than the one they left behind…By publishing this manual, the International Social Service (ISS) is calling for greater collaboration between countries, governments and their respective child protection agencies and organisations, and for the establishment of effective transnational referral processes for the protection of children on the move. 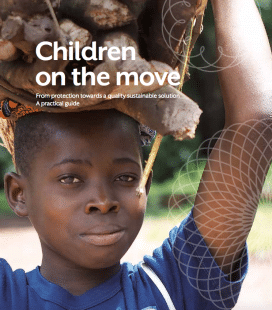 The manual is both a roadmap for policy-makers and a daily guide for professionals working with children on the move – from humanitarian workers and border staff to social workers responsible for creating individualised plans that put children first.